A mountain is a large landform that stretches above the surrounding land in a limited area, usually in the form of a peak. Thanks to modern geology, we now know the true story of how mountains are formed. Simply put, they are the result of tectonic forces or volcanism. Mountains are formed by slow but gigantic movements of the earth’s crust (the outer layer of the Earth). 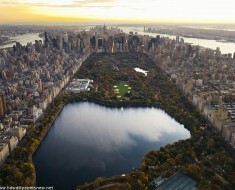 The Earth’s crust is made up of 6 huge slabs called plates, which fit together like a jigsaw puzzle. When two slabs of the earth’s crust smash into each other the land can be pushed upwards, forming mountains. Many of the greatest mountain ranges of the world have formed because of enormous collisions between continents. Volcanoes are formed when a plate is pushed below another plate, or at a mid-ocean ridge or hotspot. There is no universally accepted definition of a mountain. Elevation, volume, relief, steepness, spacing and continuity have been used as criteria for defining a mountain. • Elevation of at least 300 meters (980 feet), with a 300 meters (980 feet) elevation range within 7 kilometers (4.3 miles). 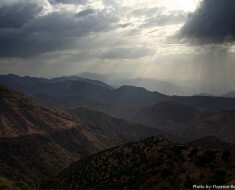 Using these definitions, mountains cover 33% of Eurasia, 19% of South America, 24% of North America, and 14% of Africa. As a whole, 24% of the Earth’s land mass is mountainous. 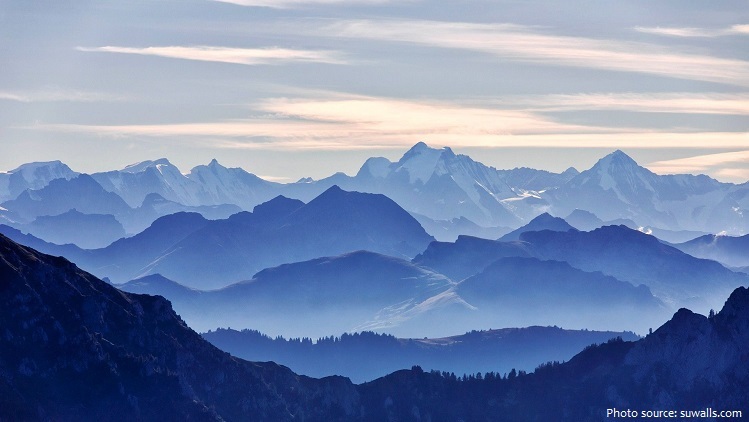 A few mountains are isolated summits, but most occur in huge mountain ranges. 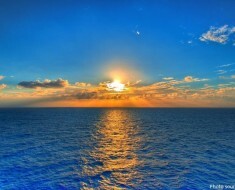 The longest mountain range is around 65,000 kilometers (40,400 miles) long—and 90 percent is under the ocean! 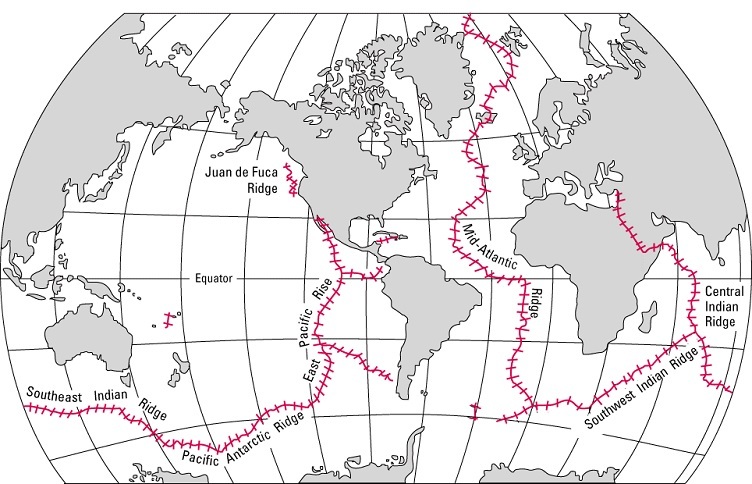 Called the Mid-Ocean Ridge, it wraps around the globe like the seams of a baseball. 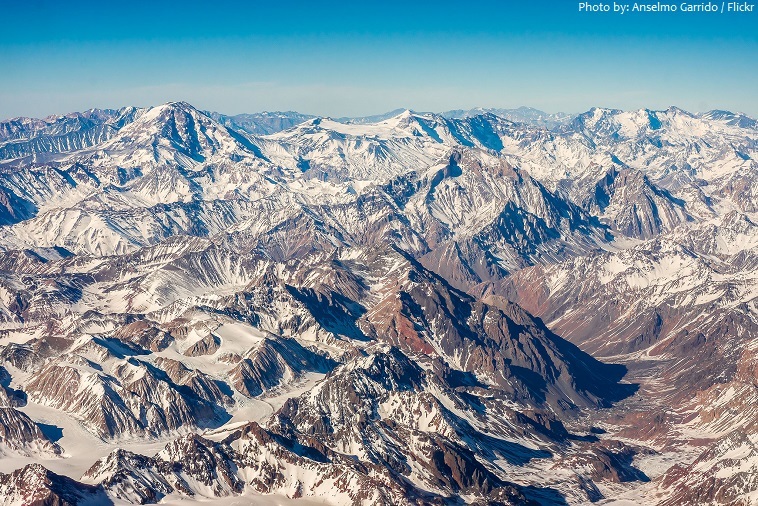 The world’s longest above-water mountain range is the Andes, about 7,000 kilometers (4,300 miles) long. The range stretches from north to south through seven countries in South America, along the west coast of the continent: Venezuela, Colombia, Ecuador, Peru, Bolivia, Chile, and Argentina. The highest mountain on Earth is Mount Everest in the Himalayas of Asia, whose summit is 8,848 meters (29,029 feet) above mean sea level. The summit is the border of Nepal to the south and China or Tibet on the north. It is over 60 million years old. 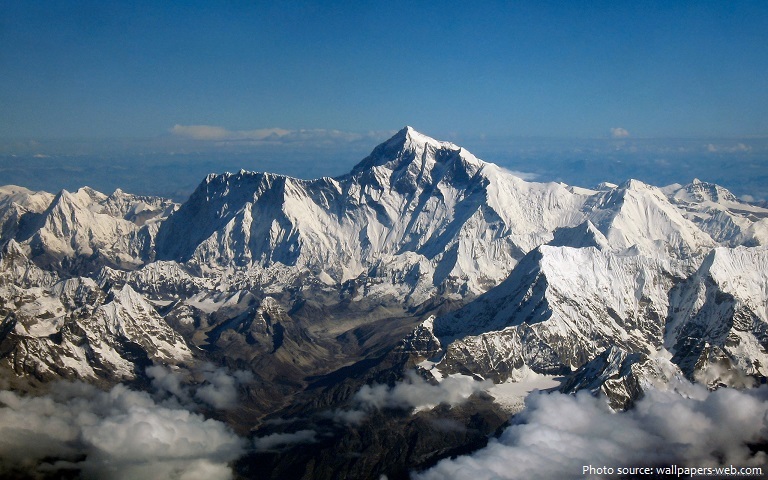 Because of tectonic plate movement, Everest grows about 4 millimeters (0.16 inch) per year. Aconcagua is the highest mountain outside Asia, at 6,960.8 meters (22,837 feet), and the highest point in both the Western Hemisphere and the Southern Hemisphere. 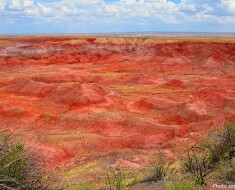 It is located in the Andes mountain range, in the Mendoza Province, Argentina. 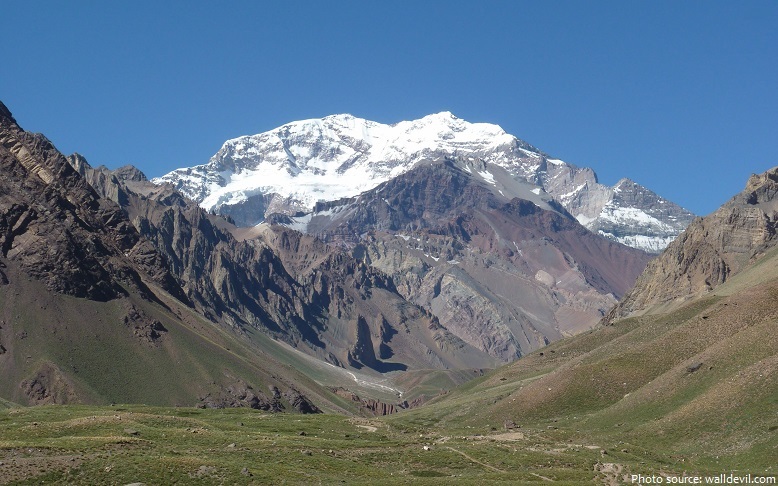 Aconcagua is the second highest of the Seven Summits (the highest peaks of the 7 continents). 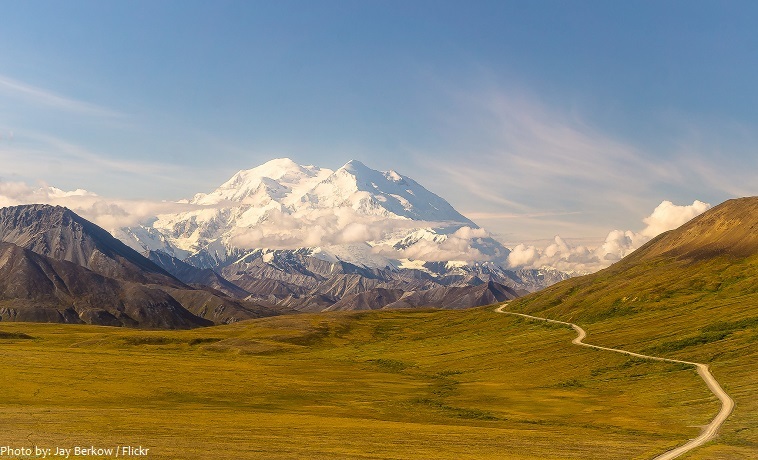 Denali is the tallest land-based mountain on Earth—with a vertical rise of about 5,500 meters (18,000 feet), as well as the highest mountain peak in North America—with a summit elevation of 6,190 meters (20,310 feet) above sea level. Denali is the third highest of the Seven Summits. Mount Kilimanjaro is the highest mountain in Africa, about 4,900 meters (16,100 feet) from its base to 5,895 meters (19,341 feet) above sea level. 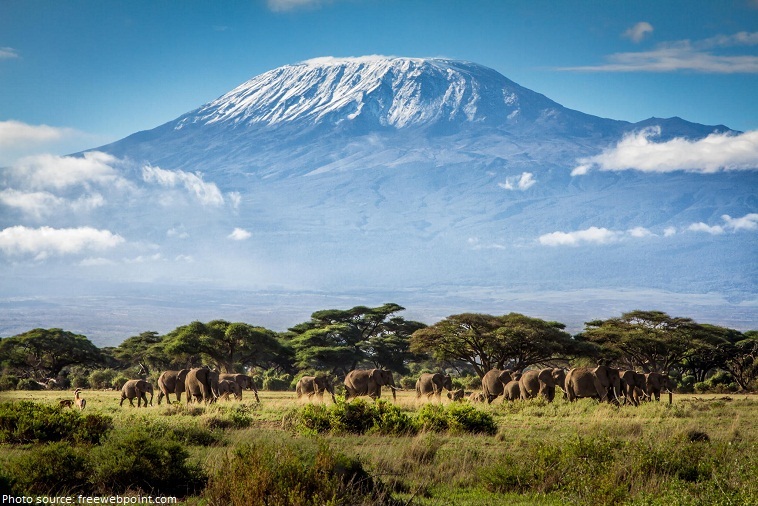 Mount Kilimanjaro is volcanic mountain with its three volcanic cones, “Kibo”, “Mawenzi”, and “Shira.” Kilimanjaro is the fourth highest of the Seven Summits. Mount Elbrus is the highest mountain in Europe. A dormant volcano, Elbrus is in the Caucasus Mountains in Southern Russia, near the border with Georgia. Elbrus has two summits, both of which are dormant volcanic domes. The taller west summit is 5,642 meters (18,510 feet), the east summit is 5,621 meters (18,442 feet). 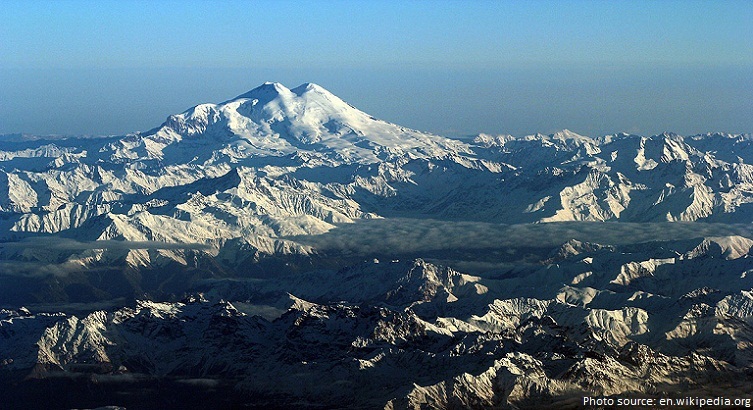 Mount Elbrus is the fifth highest of the Seven Summits. Mount Kosciuszkois Australia’s highest mountain, at 2,228 meters (7,310 feet) above sea level. 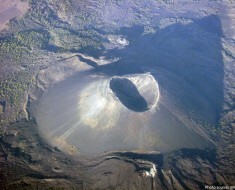 However, the highest mountain in the Australian continent (which consists of New Guinea, the country of Australia, Timor, other islands, and submerged continental shelf) is Puncak Jaya, 4,884 meters (16,024 feet) above sea level, in the Indonesian province of Papua on the island of New Guinea, which lies on the Australian continental shelf. 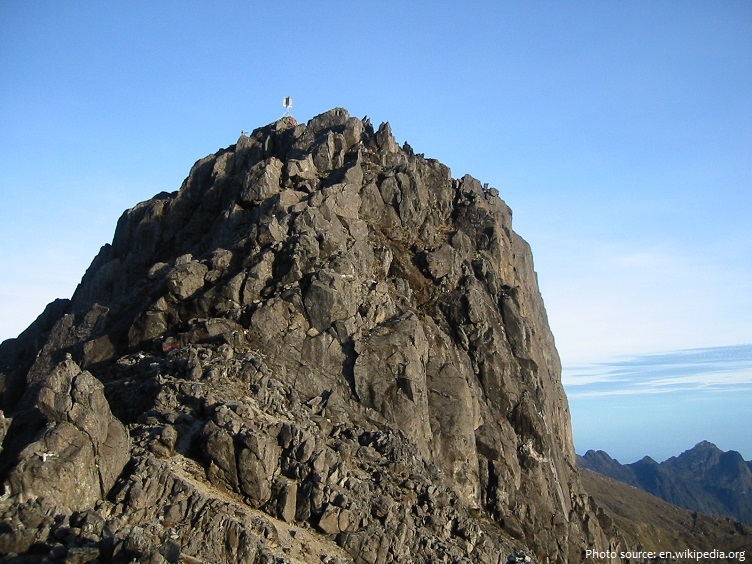 Puncak Jaya [photo below] is the sixth highest of the Seven Summits. 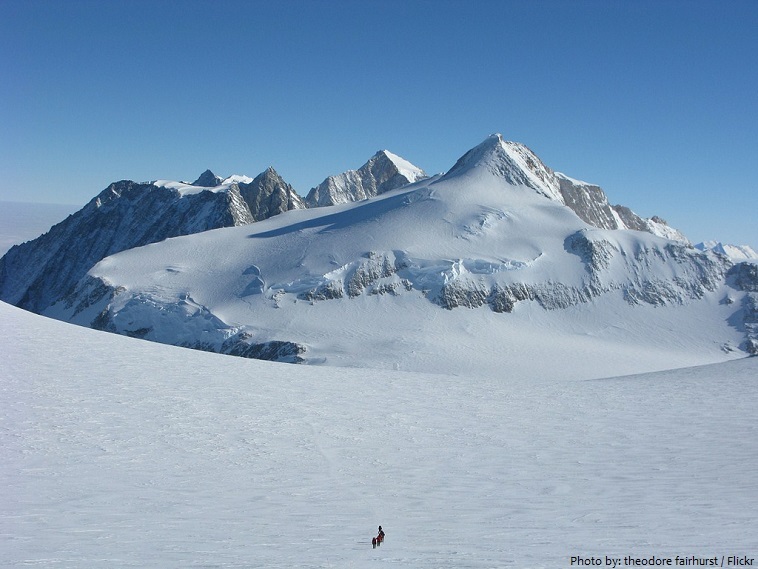 Mount Vinson is the highest peak in Antarctica, with an elevation of 4,897 meters (16,066 feet). It was first climbed in 1966. Mount Vinson is the seventh highest of the Seven Summits. The peak of Chimborazo in the Ecuadorean Andes is the farthest point from the center of the earth. Chimborazo mountain stands 6,268 meters (20,564 feet) above sea level, is actually 6,384 kilometers (3,944 miles) from the Earth’s core, making it 2 kilometers (1.24 miles) higher than its counterpart in the Himalayas due to differences in the planet’s diameter on different continents. So Chimborazo is, in fact, the place on Earth that is closest to the moon and outer space. The bases of mountain islands are below sea level, and given this consideration Mauna Kea (4,207 meters (13,802 feet) above sea level) is the world’s tallest mountain and volcano, rising about 10,203 meters (33,474 feet) from the Pacific Ocean floor. K2, also known as Mount Godwin Austen or Chhogori is the second highest mountain in the world, after Mount Everest, at 8,611 meters (28,251 feet) above sea level. There are at least 100 mountains with heights of over 7,200 meters (23,622 feet) above sea level, all of which are located in central and southern Asia. The highest known mountain on any planet in the Solar System is Olympus Mons on Mars at 21,171 meters (69,459 feet). 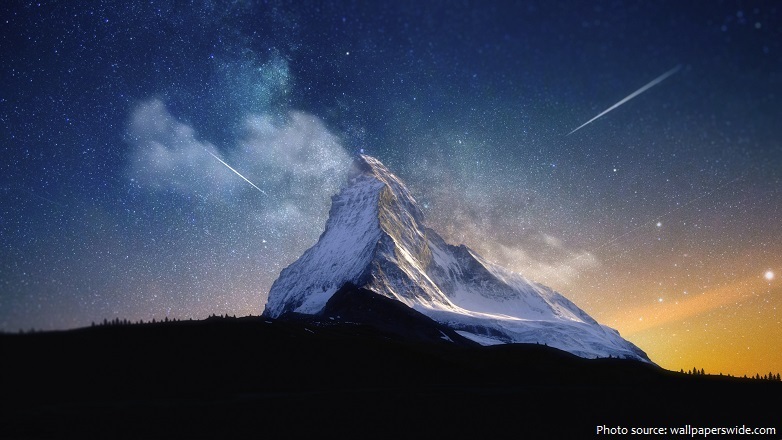 The triangular shape of the Matterhorn in the Swiss Alps is commonly believed to have given Theodor Tobler his inspiration for the shape of Toblerone. The image of the Matterhorn first appeared on Toblerone chocolate bars in 1960.